Here are five things we learned from the 0-0 draw between Denmark and Ireland in Aarhus. 1 - Ireland really are terrible to watch. No shots on target again for the entire 90 minutes, possession below 30 per cent, the entire team defended too deep, there is little or no creativity and even Robbie Brady’s few set pieces were poor. O’Neill has invented a new brand of football: Long Ball To Nowhere. 2 - Team selection is limited for Martin O’Neill who probably named his strongest side available (Cyrus Christie aside). The starting XI have made just 96 league starts between them this season. Take away Randolph (17), Keogh (17), Stevens (16) and Duffy (12) and the rest, who have all yet to hit double figures, comes to just 34 starts. 3 - Cyrus Christie is still not a midfielder. Despite having more experienced midfielders, O’Neill perseveres with the Fulham full-back. Lost possession in key areas a couple of times leading to chances for Eriksen and Poulsen and struggled to make telling passes. And if he is in the Irish team for his long throw-ins, why was he dropped and sold by Tony Pulis at Middlesbrough? 4 - Ireland cannot score. Kasper Schmeichel was suspended but his replacement Frederick Roennow didn’t need to play. Just four goals in the nine games of 2018 and it is now three minutes short of 400 minutes since Ireland last netted (Aiden O’Brien in the 1-1 draw versus Poland). O’Brien was the latest unfortunate forward to receive zero service last night before Callum Robinson, Ronan Curtis and Michael Obafemi had the same thankless task. But they can defend. They have conceded two goals in four games since the 4-1 drubbing in Cardiff. 5 - Martin O’Neill will survive for the Euro 2020 draw in Dublin and start of that campaign. 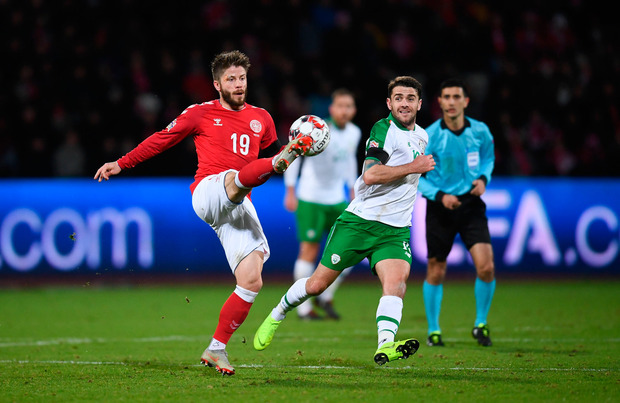 Although FAI chief executive John Delaney is concerned at the Nations League relegation amid flat performances and increasing apathy of fans, Ireland avoided a drubbing in the Aarhus dead rubber. This goalless draw in Denmark (the third against them in a year) is a good result even if the performance and football was far from it.